Had Yao Pier is located on the very long strip of "Had Yao" ("Long Beach") in Trang, which is an interesting rocky headland full of cliffs and caves. The pier is very functional, allowing ferries to simply dock to drop off and pick up their excited passengers. 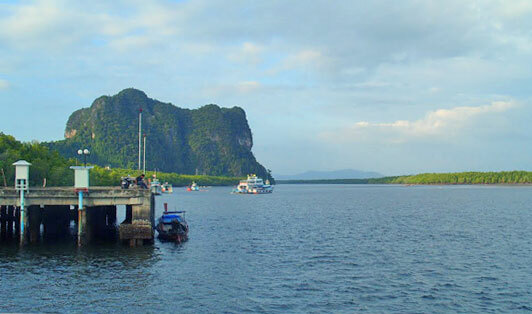 Trang is a fantastic hub to islands such as Koh Libong, Koh Mook, Koh Kradan and Koh Lipe, and year upon year, thousands of travellers and seafarers visit Had Yao Pier. Make sure that you arrive at least 45 minutes before ferry departure. Simply show the ferry staff your printed e-ticket that we have sent to you. They will take this from you and replace it with a sticker that you will wear for your ferry trip. The staff are all familiar with us at phuketferry.com and your boarding process is going to be 'plain sailing'! Address : Check-in Point: Inside the Hat Yao Pier building, Trang.